A perfect marriage of sweet and savory marinade ingredients, along with the foil-cooking method, take salmon filets to a whole new level. Broiling at the very end is necessary to create caramelization on top. In a large zip top bag, combine honey, soy sauce, rice vinegar, sesame oil, ginger, garlic, green onion, red pepper, pepper, and salt. Zip shut and shake to combine. Add salmon filets, zip, and make sure salmon is covered in marinade. Set in the refrigerator for 15-30 minutes, turning once or twice to evenly distribute marinade. Remove salmon from marinade and place onto the prepared baking sheet and fold up all 4 sides of the foil. Pour the marinade over the salmon. Pinch the sides of the foil shut over the salmon, covering completely and sealing the packet closed but leaving a little space at the top. Place in oven and bake until cooked almost through, about 15-20 minutes. * Remove and open the packet. Turn on broiler (don’t worry about preheating it) and broil for 2-3 minutes, or until caramelized and slightly charred. 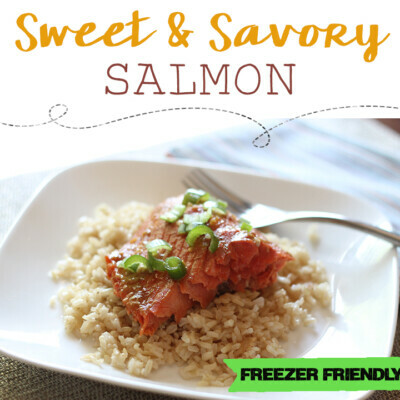 Serving Suggestion: Garnish with green onions and serve salmon and the cooked sauce at the bottom of the foil pack over brown rice. *The cooking time may vary depending on the thickness of the filet. Salmon is done when it flakes easily with a fork, no longer looks translucent and becomes a cloudy, pink color. Do not overcook! Complete Step 1, preparing marinade in zip top bag. Then, if salmon is not already frozen, place it in a separate zip top bag. Squeeze all air out of bags and seal. Freeze together immediately. Thaw bags in the refrigerator or using the cool water method (submerge sealed freezer bag in cold water until thawed, replacing water every 30 minutes). Then, prepare according to directions (Steps 2-5).